Vancouver, BC; November 28, 2018 – Tonight, Iron Chef Rob Feenie prevailed once again in Food Network Canada’s Iron Chef Canada kitchen stadium defeating challenger Chef John Horne in Battle Bivalve. Chef Horne oversees restaurants including Toronto’s Canoe in his role as District Executive Chef at Oliver & Bonacini Hospitality. 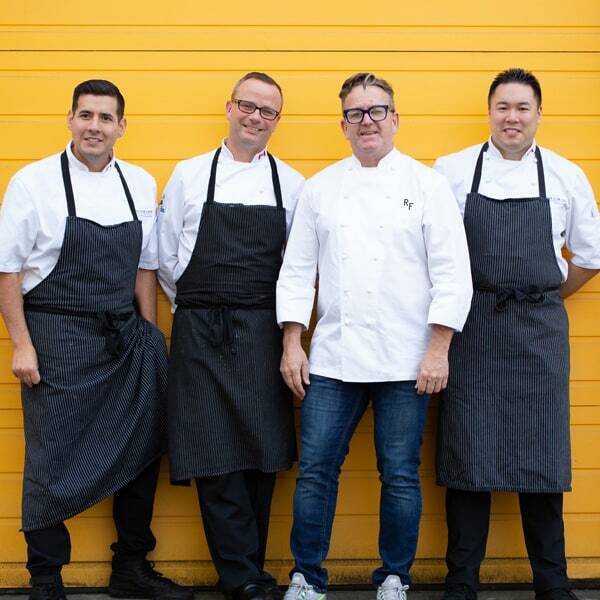 Feenie was supported by Cactus Club Cafe sous chefs Henry Wong and Wayne Harris as they created five dishes featuring the secret ingredient: bivalves. Their first dish was scallop carpaccio with Northern Divine caviar from B.C.’s Sunshine Coast. They incorporated the culinary curveball, sea salt and vinegar chips, into the topping for baked razor clams with parsley and garlic butter. Feenie, renowned for his ravioli, created a standout dish inspired by the Italian classic spaghetti alle vongole by stuffing ravioli with fresh clams in a butter sauce. Tonight, Chef Feenie was joined at Cactus Club Cafe Coal Harbour by friends, family, colleagues and media who gathered to watch the Iron Chef Canada broadcast on Food Network Canada at 7 p.m. PT/10 p.m. ET. This is Chef Feenie’s second victory in the inaugural season of Iron Chef Canada. On October 24, he battled fellow B.C. chef and mentee, Ned Bell. 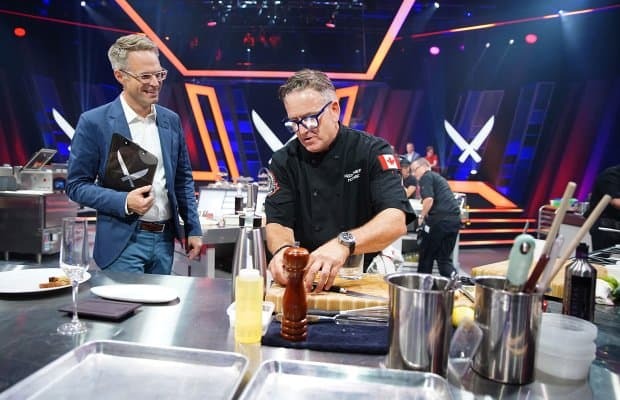 “One of the best things about Iron Chef Canada is that it not only showcases Canada’s top culinary talent but also food and high-quality ingredients that are truly Canadian,” continues Feenie. Chef Feenie’s Iron Chef journey began in 2005 when he defeated Iron Chef Masaharu Morimoto, becoming the first Canadian to winIron Chef America. In that battle, as in tonight’s, Chef Feenie was supported by Sous Chef, Wayne Harris. Iron Chef Canada airs Wednesdays at 7 p.m. PT/10 p.m. ET on Food Network Canada. 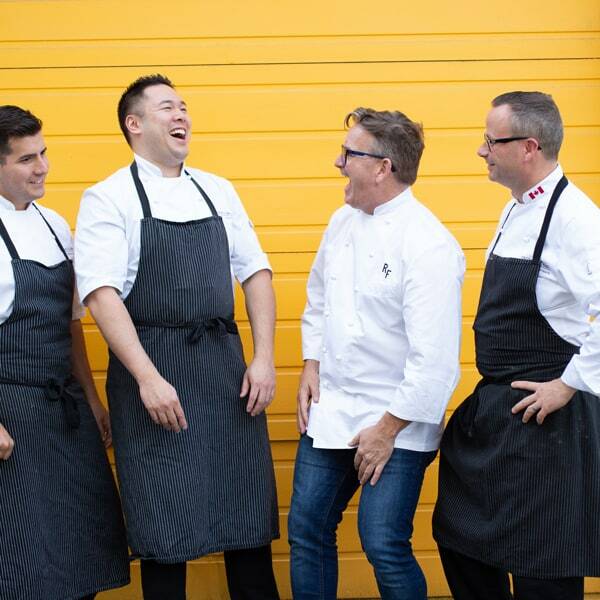 Chef Feenie’s battle will repeat on November 29 at 8 p.m. PT/11 p.m. ET, December 2 at 3 p.m. PT/6 p.m. ET and December 4 at 11 a.m. PT/2 p.m. ET and can be streamed on www.foodnetwork.ca /shows/iron-chef-canada/video.